The EuroQSAR Symposia have been taking place since 1973 in different European countries. These Symposia have been major scientific events in the field of computational drug design, with applications in agricultural and environmental sciences. Fifty years ago in 1964 Corwin Hansch and Toshio Fujita published in JACS their famous report “Rho sigma pi analysis. A method for the correlation of biological activity and chemical structure”. According to July 2014 Web of Science search, this first report regarding the general ligand-based drug design approach has been cited 2008 times! Moreover, current PubMed search points toward over 170 thousand (Q)SAR-related papers published by thousands of enthusiastic researchers during the past fifty years. Extensive studies of 3D protein structures, development of computational techniques and methods created the basis for molecular modeling that provide the mechanistic interpretation of ligand-target interaction. Today ligand-based, target-based and combined drug design methods are widely used in search and optimization of new lead compounds with improved pharmacodynamic and pharmacokinetic characteristics. The progress of high-throughput postgenomic technologies has led to better understanding of human disorders at the molecular level. Achievements in synthetic organic chemistry have provided a lot of “chemical probes” for studying biological processes in normal and pathological states. Current knowledge suggests that the majority of biologically active compounds interact with multiple molecular targets exhibiting pleiotropic pharmacological actions. Moreover, due to the complex signal transduction processes in cell, interaction with a particular target not always leads to the desirable effect; therefore, we need to study the integrative approaches of “Networks Pharmacology”, “Chemogenomics”, “Chemical Biology”. With its general theme of “Understanding Chemical-Biological Interactions”, the 2014 EuroQSAR symposium not only followed the tradition of previous events in presenting latest trends in QSAR and molecular modeling, but it also explored new grounds, such as representation, visualization and navigation of chemical-biological space, chemo- and bioinformatics approaches to multi-target (Q)SAR, modeling of protein-ligand interactions, computational toxicology in drug and chemical safety assessment, translational bioinformatics, and emerging QSAR and modeling methods. Finally, EuroQSAR 2014 included the Corwin Hansch honored session devoted to grand challenges for QSAR, and conducted as round table on (Q)SAR related European initiatives as well as a special session dedicated to the hot topics on modern techniques in computer-aided drug discovery. The scientific program of the Symposium includes 11 lectures, 38 oral talks, 4 brief communications of young scientists obtained the Best Poster Awards, 3 companies' workshops, and 157 posters. Opening lecture "(Q)SAR, the Lifelong Learning for my Research Career" was presented by Prof. Toshio Fujita (Kyoto University, Japan), together with Corwin Hansch laid the foundation for the modern QSAR. Curt Breneman (Rensselaer Exploratory Center for Cheminformatics Research, Troy, United States) "From QSAR to MQSPR and Beyond: Predictive Materials Informatics Using a Blend of Heuristic and Physics-Based Methods". Roberta Bursi (Grünenthal, Aachen, Germany) "Integrating Pharmacometrics into Drug Development". Helena Danielson (Uppsala University, Uppsala, Sweden) "Lead Discovery and Optimisation by Use of Interaction Kinetic Analysis". Peter Ertl (Novartis Institute for Biomedical Research, Basel, Switzerland) "Navigation in Chemical Space Towards Biological Activity". Catrin Hasselgren (AstraZeneca, Mölndal, Sweden) "Computational Toxicology – An Essential Part of Drug Safety". John Overington (EMBL-EBI, Cambridgeshire, United Kingdom) "Chemical Informatics Applied to Health and Drug Safety". Will Pitt (UCB Pharma, Slough, United Kingdom) "Ensemble-Based Drug Design, Combining Protein Structures and Simulations". John Reed (F. Hoffman-la-Roche, Basel, Switzerland) "Opportunities and Challenges in Therapeutics Discovery and Development". Joerg Kurt Wegner (Johnson & Johnson, Beerse, Belgium) "Large-Scale Chemogenomics in Pharma - Definition, Benchmarking, and Application". Anna Linusson (Umea University, Umea, Sweden) "On the Nature of Non-Classical Hydrogen Bonds and Aromatic Interactions". Tudor Oprea (University of New Mexico, Albuquerque, United States) "The Road Ahead: New Challenges for Computational Forecasts". Oleg Raevsky (Institute of Physiologically Active Compounds, Moscow, Russia) "In Silico Prediction of Aqueous Solubility, from Random Global Model to Individual Local Regression for Each Chemical of Interest". Nikolay Zefirov (Moscow State University, Moscow, Russia) "Molecular Design of Bivalent and Dual Action Drugs". Andreas Bender - Hansch Awardee (University of Cambridge, Cambridge, United Kingdom) " Hansch Awardee: Lessons Learned from Chemical and Biological Data - Scientifically, and Personally". Gerhard Ecker (University of Vienna, Vienna, Austria) "Open PHACTS - The Use of Open Data for in silico Models". Ferran Sanz (University Pompeu Fabra, Barcelona, Spain) "eTOX: Integrative Strategies for Predicting Drug Toxicities". Ronald Frank (FMP, Berlin, Germany) "EU-Openscreen: A Pan-European Resource and Infrastructure to Support chemical Biology Research". Maria Putseleva (Delegation of The European Union to Russia, Russia) "EU's Framework Programme for Research and Innovation Horizon 2020: Cooperation Opportunities". The Symposium was attended by 271 researchers from 38 countries: Russia - 78 people; Germany - 32 people; USA - 18 people; Sweden, Italy, Japan - 12 people from each country; France - 10 people; Belgium, Spain - 8 people from each country; Austria, South Korea - for 6 people from each country; China, Estonia, Sweden - 5 people from each country; Bulgaria, the Czech Republic - 3 people from each country; Ukraine, Australia - 2 persons from each country; one person from each country - Algeria, Armenia, Belarus, Brazil, Greece, Denmark, Israel, India, Iran, Kazakhstan, Cuba, Kyrgyzstan, Macedonia, Netherlands, Serbia, Finland, South African Republic. 43.2% of the participants of the Symposium were presented by researchers from academic institutes and universities; 26.4% - professionals working in the industry; 30.4% - students, graduate students and postdocs. 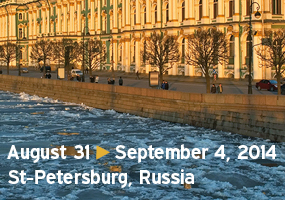 An important part of the symposium EuroQSAR-2014 became the School for Young Russian Scientists on computer aided drug design methods, which was held at the St. Petersburg State Chemical-Pharmaceutical Academy on 28-30 August 2014 (www.euroqsar2014.ru). School-seminar was attended by 124 scientists and students from different regions, including St. Petersburg, Moscow, Arkhangelsk, Barnaul, Volgograd, Vsevolozhsk, Yerevan, Kazan, Chernogolovka, Minsk, Moscow, Nizhny Novgorod, Novosibirsk, Pushchino, Sevastopol Sertolovo, Syktyvkar, Taganrog, Tomsk, Cheboksary, Yaroslavl. EuroQSAR-2014 Symposium was organized by the Russian Ministry of Education and Science, Committee on Science and High School of the Saint-Petersburg Government, Saint-Petersburg State Chemical-Pharmaceutical Academy, Saint-Petersburg State Research University of Informational Technologies, Mechanic and Optics, Institute of Biomedical Chemistry, and LD Organisation; it was supported by the European Federation of Medicinal Chemistry Societies. We would like to express our most sincere gratitude to all organizations that helped to organize the symposium, including and sponsors who supported this symposium through their generous financial and scientific contributions. EuroQSAR 2014 has continued the tradition of advancing the science of computational drug discovery and pharmacoinformatics, promoting cooperation between scientists from all over the world. I am sure that this Symposium became a memorable event for the attendees, both scientifically and socially.